time. Pork exports, meanwhile, easily surpassed the previous year’s volume record. The U.S. Meat Export Federation reports beef exports totaled 1.26 million metric tons, up six percent from 2016. This was the fourth-largest volume on record and the second-largest of the post-BSE, or mad cow disease, era. Beef export value reached $7.27 billion, up 15 percent year-over-year and two percent above the previous high achieved in 2014 of $7.13 billion. Pork exports totaled 2.45 million metric tons in 2017, breaking the 2016 record by six percent. Export value was $6.49 billion, up nine percent year-over-year, and the second-highest on record, trailing only 2014’s $6.65 billion. Pork exports accounted for 26.6 percent of total production in 2017 and 22.3 percent for muscle cuts only, each up nearly a full percentage point from a year ago. 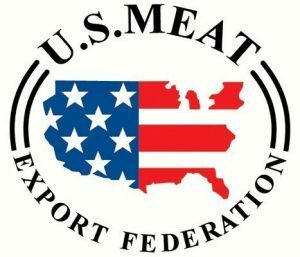 2017 was a record-breaking year for U.S. red meat exports, with beef export value exceeding $7 billion for only the second time and pork exports easily surpassing the previous year’s volume record, according to data released by USDA and compiled by USMEF. Beef exports totaled 1.26 million metric tons (mt), up 6 percent from 2016. This was the fourth-largest volume on record and the second-largest of the post-BSE era. Beef export value reached $7.27 billion, up 15 percent year-over-year and 2 percent above the previous high achieved in 2014 ($7.13 billion). For December only, beef export value was up 9 percent from a year ago to $672.9 million – the second-highest of 2017 and the third-highest on record. December volume was down 3 percent from a year ago to 113,269 mt. Beef exports accounted for 12.9 percent of total production in 2017 and 10.4 percent for muscle cuts only, down from 13.7 percent and 10.5 percent, respectively, in 2016. Beef export value averaged $286.38 per head of fed slaughter, up 9 percent from 2016 and the second-highest on record, trailing only the $300.36 average posted in 2014. Pork exports totaled 2.45 million mt in 2017, breaking the 2016 record by 6 percent. Export value was $6.49 billion – up 9 percent year-over-year and the second-highest on record, trailing only 2014 ($6.65 billion). For December only, pork export value was up 5 percent from a year ago to $591.1 million. This was the second-highest total of 2017, trailing only the record value achieved in November ($615.8 million). December volume was down 1 percent from a year ago to 219,809 mt. Pork exports accounted for 26.6 percent of total production in 2017 and 22.3 percent for muscle cuts only, each up nearly a full percentage point from a year ago. Pork export value averaged $53.47 per head slaughtered, up 6 percent from 2016. Japan solidified its position as the leading market for U.S. beef in 2017, with volume climbing 19 percent year-over-year to 307,559 mt and value up 25 percent to $1.89 billion – new post-BSE records. Chilled exports to Japan expanded even more rapidly, reaching 148,688 mt (up 32 percent) valued at $1.102 billion (up 37 percent) as U.S. beef captured more than half of Japan’s imported chilled beef market – a new high for U.S. market share. Japan accounts for nearly $75 in export value per head of fed slaughter and delivers critical premiums for certain cuts. For example, Japan’s imports of U.S. beef tongue averaged $12.13 per head and imports of short plate averaged $26.44. The U.S. industry is marketing a wide range of beef cuts in Japan and the market holds potential for additional growth. But market access is a concern, with imports of Australian and Mexican beef subject to significantly lower duties and beef from Australia, Canada, New Zealand and Mexico all poised to gain further tariff relief through the Comprehensive and Progressive Agreement for Trans-Pacific Partnership (CPTPP). Beef exports to South Korea increased 3 percent in volume (184,152 mt) and climbed 15 percent in value to $1.22 billion, easily outpacing the previous year’s record. Chilled U.S. beef achieved tremendous growth, increasing 73 percent in volume (45,153 mt) and 78 percent in value ($405.8 million). Demand is especially strong in the Korean retail sector, where consumer confidence in the quality and safety of U.S. beef continues to gain momentum. Korea’s imports of U.S. beef are now subject to a 21.3 percent tariff, down from 24 percent in 2017 and well below the 40 percent rate in effect prior to implementation of the Korea-U.S. Free Trade Agreement (KORUS). The tariff rate is scheduled to decline to zero by 2026. Mexico remained the second-largest volume market (237,972 mt, down 2 percent from 2016) and third-largest in value ($979.7 million, up slightly). It is an especially important market for U.S. beef shoulder clods, rounds and variety meat. Exports to Taiwan set a new value record, increasing 13 percent from a year ago to $409.7 million. Volume was up 2 percent to 44,800 mt. U.S. beef holds 72 percent of Taiwan’s chilled beef market, the highest share of any Asian destination. Taiwan is a key market for secondary beef cuts such as the clod heart, petite tender and top sirloin cap. Demand in Hong Kong rebounded from a slow start to post a strong performance in 2017, increasing 16 percent in volume (130,726 mt) and 29 percent in value ($884.1 million). After China’s mid-year lifting of its ban on U.S. beef, exports to China totaled 3,020 mt valued at $31 million. While eligible supplies remain limited due to China’s import restrictions, the market holds significant growth potential and is already one of the highest value markets for U.S. beef on a per-pound basis. Record exports to the Philippines and Singapore and strong growth in Indonesia and Vietnam pushed export volume to the ASEAN region up 37 percent to 40,954 mt, while value climbed 34 percent to $210.9 million. Strong performances in Chile, Peru and Colombia led the way for U.S. beef in South America, where export volume increased 24 percent to 28,383 mt and value was up 23 percent to $114.8 million. Shipments to Brazil, which resumed in April after a 13-year absence, totaled 2,035 mt valued at $7.4 million. Led by strong beef liver demand in South Africa, exports to Africa increased 78 percent in volume (22,001 mt) and 74 percent in value ($22 million). Since reopening to U.S. beef in 2016, South Africa has emerged as the sixth-largest destination for U.S. beef variety meat and second-largest for livers. Strong demand for U.S. hams set the pace for the sixth consecutive volume record for pork exports to Mexico at 801,887 mt, up 10 percent year-over-year. Export value reached $1.51 billion – up 12 percent and the second-highest on record, trailing only 2014 ($1.56 billion). Per capita pork consumption in Mexico has grown by about one-third over the past 10 years and now stands at 18 kilograms. This rapid growth has been bolstered by USMEF’s trade education and outreach efforts and continuous engagement with Mexico’s importers, distributors and processors, as well as duty-free access under NAFTA. Exports to leading value market Japan increased 2 percent in volume (393,648 mt) and 4 percent in value ($1.63 billion). Chilled pork export volume to Japan was down slightly to 217,857 mt, while value was up 4 percent to $1.03 billion. Similar to beef, market access to Japan is a growing concern for the U.S. pork industry as trade barriers for Canadian, Mexican and Chilean pork will be reduced under CPTPP and the European Union will soon finalize an economic partnership agreement with Japan. Exports to Korea soared 28 percent in volume to 173,182 mt, valued at $475 million – up 30 percent year-over-year and the second-highest on record (exports reached $497 million in 2011, when Korea was in recovery from a foot-and-mouth disease outbreak). Korea’s pork consumption set another new record in 2017 and demand has been fueled in part by a growing preference for protein-centric convenience foods and home meal replacement items. Most U.S. pork now enters Korea duty-free under KORUS. Booming demand in Colombia and Chile and a growing presence for U.S. pork in Peru fueled a record performance in South America, where exports were up 57 percent in volume (103,987 mt) and 58 percent in value ($268 million). Most U.S. pork entering South America is destined for further processing, but USMEF continues to make inroads in the retail sector and with U.S.-origin processed products. Exports to the region could gain further momentum in 2018, when Argentina is expected to reopen to U.S. pork and as pork consumption continues to grow in existing markets. 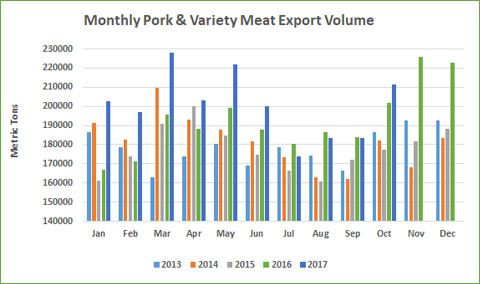 Pork exports to Central America were also record-large in 2017 at 73,891 mt (up 6 percent), valued at $179.8 million (up 8 percent), led by solid growth in mainstay markets Honduras and Guatemala. Exports to the Dominican Republic also set a new record, with volume up 20 percent to 30,803 mt and value increasing 26 percent to $71.1 million. Despite being limited to processed products and raw material destined for further processing, exports to Australia set a new volume record at 70,985 mt (up 12 percent) and climbed 17 percent in value to $208.3 million. Australia is an especially important destination for U.S. hams. Strong growth in the Philippines, Singapore and Vietnam pushed exports to the ASEAN region up 15 percent in volume (47,725 mt) and 30 percent in value ($128.2 million). China/Hong was the second-largest volume destination for U.S. pork at 495,637 mt. This was down 9 percent from a year ago as China’s total imports decreased, reflecting a rebound in domestic production. However, export value was up slightly from 2016 at $1.08 billion. The region is the largest destination for U.S. pork variety meat, with 2017 exports up 2 percent in volume to 321,116 mt. The value of these exports climbed 16 percent to $741.8 million, as variety meat exports to China/Hong Kong accounted for an average of $6.12 per U.S. hog slaughtered. On a global basis, U.S. pork variety meat exports were up 4 percent to 543,973 mt, while export value was up 17 percent and easily the highest on record at $1.17 billion, averaging a record $9.67 for every hog processed. U.S. lamb exports were down 14 percent in volume (7,261 mt) in 2017, but value increased 7 percent to $19.5 million. 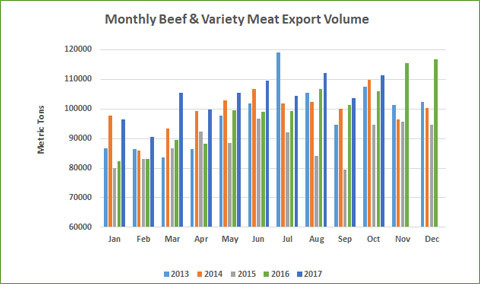 The volume decline was due to slow demand for variety meat, as muscle cuts exports increased in both volume (2,421 mt, up 8 percent) and value ($14.2 million, up 16 percent), including strong gains in the Caribbean, Canada and Central America. U.S. lamb gained access to Taiwan in 2016 and recently became eligible for Guatemala and El Salvador. However, expanding market access for U.S. lamb remains a priority for USMEF, as lamb is still ineligible in many key markets including Japan, Korea, China and South America. Complete 2017 export results for U.S. beef, pork and lamb are available from USMEF’s statistics web page.